1. Place the brie in the freezer for about 20 minutes. It is easiest to cut neatly when it is very cold. 2. While you are waiting for the cheese to cool, begin tempering the chocolate. Tempering the chocolate will allow you to have a shiny outer coating that stays firm at room temperature. It's not absolutely necessary, but I do recommend it if you have the time. To learn how to temper chocolate, follow these instructions. As an alternative, you can use melted candy coating. 3. Once the chocolate is melted or tempered, remove the cheese from the freezer. Use a sharp knife to cut it into approximately 24 small bite-sized squares. 4. Use dipping tools or a fork to dip each piece of brie into the melted chocolate. Place the dipped candies on a baking sheet covered with foil or waxed paper. While the chocolate is still wet, sprinkle the top with a pinch of flaked sea salt. 5. Let the chocolate set completely, either at room temperature or in the refrigerator. 6. 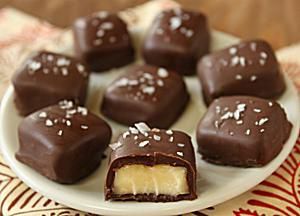 Chocolate-Covered Brie Bites can be kept in an airtight container in the refrigerator for up to a week. For best taste and texture, allow them to come to room temperature before serving so that the cheese in the center is nice and soft.